Polish Jewish Cabaret: Nerven, nerven! MY NERVES ARE KILLING ME. Angst in the pre-war Yiddish community. Nerven, nerven! MY NERVES ARE KILLING ME. 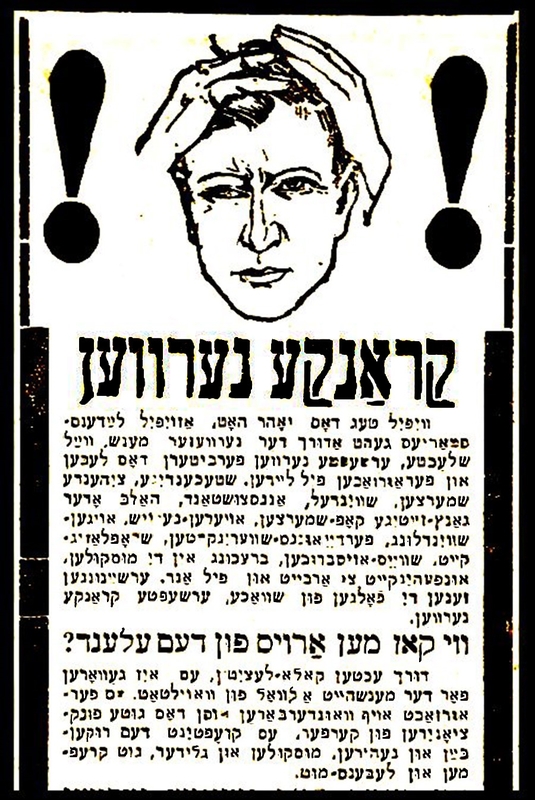 Angst in the pre-war Yiddish community. Or click the album cover to hear and/or buy the song Nervn Nervn on our cd, Nervez! Here's a marvelous advertisement from a 1920s era Polish newspaper. The headlines read "SICK NERVES" and "HOW CAN ONE ESCAPE THE DESOLATION." I'm not sure what kind of remedy this doctor was promoting but you get the idea. This song, with an intentionally annoying little tune, was copyrighted by Aaron Lebedeff in 1925, and I transcribed it from his submission at the Copyright Office at the Library of Congress. In Zylberzweig's Lexicon, and in Zhelonek's book, the song is attributed to Shlomo Lindenfeld. You can hear Jacob Zanger singing this crazy-making song on the cd called "The Great White Way." Of course, there is a different set of lyrics from each of these coupletists. The words Randy Kloko sang are his favorite couplets accumulated from the various versions and the translation of what he sang is below. By the way, I know in YIVO standard transliteration these days nerven is actually spelled nervn but Zhelonek spelled it with the ayin and so do I. Big thanks to Roger Lynn Spears, our pianist, for listening to what I wanted ("Charles Ives" came into the description) and doing exactly what needed to be done. In 1924, in order to end inflation, Grabski the Polish finance minister introduced a new currency (the zloty) which he supported through austerity, US loans and a balanced budget. To balance the budget he raised taxes a lot and the burden fell heavily on the urban merchant class, ie the Jews. If you didn't pay taxes they would come to your house and confiscate your property to pay the debts. The wagon used was called Grabski's agile. they won’t leave me alone! Suddenly I see what’s going on, all the merchants raise an outcry!